I have wanted to try and make salted caramel for quite some time now, but I have just not got around to trying it. On the 1st of September I opened my RSS reader to see what this month’s Fresh From The Oven challenge is, and salted caramel focaccia from Signor Biscotti showed up. Dave and I went shopping on Spring Day – and remarked at the amount of snow that fell on Friday night. Our mountain tops are white! We bought some local salted butter and I came home to make the focaccia. I used my bread maker as it is really still too cold here for proving bread. I ended up making the sweet bread twice. Thanks for taking part in the Fresh from the Oven challenge, Tandy. And bravo for being so quick off the mark! Your version of the recipe sounds and looks lovely. Apologies for not commenting sooner. I left for a week in the wilds of Ireland immediately after posting the challenge. Had a great time – but virtually no internet! I would never have thought of a sweet focaccia and salted caramel, no less! This looks delicious! i usually eat savory foccacias but this foccacia can satisfy my sweet tooth just as easily as a slice of cake…heheh. Now this is majorly dreamy! What an inspired combination. I want some now! What a unique idea! I love it!! The title just threw me! A sweet foccacia bread…and then I read all the ingredients and the sweetness sounds like a perfect breakfast or afternoon bread. I’m definitely making note to try this soon!! 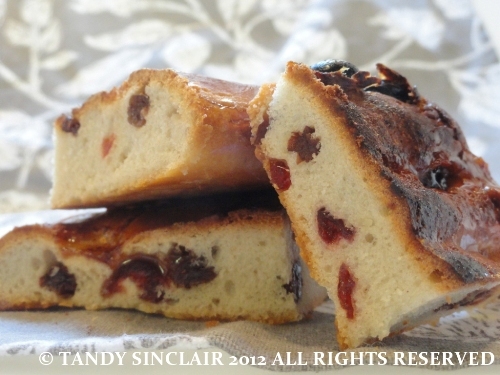 I didn’t know foccacia could be made into something so sweet and delicious!! Wonderful post today!! And lucky you to have made it twice! thanks Barbara 🙂 I would never have thought of making a sweet version! Ooh yummy! That sounds delish. Am bookmarking that one to try. You were hot off the mark here. – Can’t wait to get baking this one. 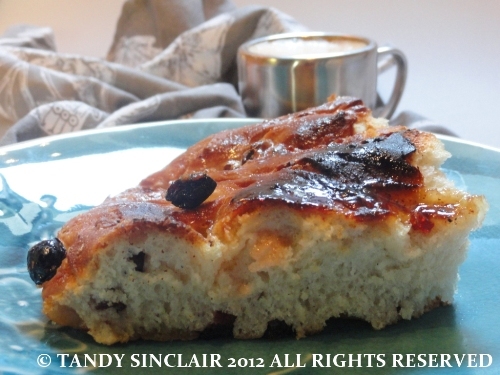 A sweet focaccia bread? Wow! Thanks Celia, it was very good! Your title alone, immediately made my mouth water. 🙂 It sounds wonderful, Tandy. Ooh, I would have loved a portion of the bread pud you made.